The 2014 Barrett Jackson Scottsdale Auction will include a pair of uniquely designed 2014 Chevrolet Camaro Linda Vaughn Edition models with the proceeds going to the charity the International Kids Alliance Network via the automotive Dreamakers group. 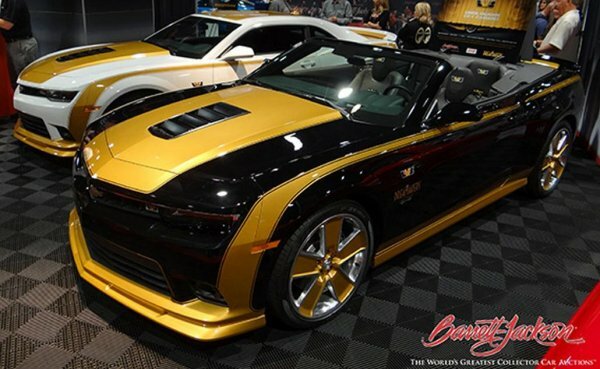 The white and gold 2014 Chevrolet Camaro LV-1 coupe and the black and gold 2014 Chevrolet Camaro LV-1 convertible headed to the January Barrett Jackson Scottsdale event are two of just 500 examples of these uniquely designed muscle cars that were penned by famous automotive designed Jack Doc Watson. Doc Watson was the man responsible for creating the original Hurst Olds back in 1968 so it makes sense that Doc would be the man in charge of designing the specially decorated to commemorate Miss Linda Vaughn. If you are somehow familiar with Miss Linda Vaughn, she is better known to many as Miss Hurst for her work serving as the buxom spokeswoman of the Hurst shifter brand beginning back in the 1960s. While Linda Vaughn is less commonly known by younger racing fans, there is a very good chance that every gearhead who dreamed of owning a muscle car during the 1960s and 1970s also dreamed of having Miss Vaughn riding shotgun while in that muscle car – presumably in one of the tiny bustier outfits that accentuated her curves to the umpteenth degree. Those who know Miss Linda Vaughn often associate her with the gorgeous white and gold Oldsmobile performance models from the 60s and 70s but with Oldsmobile long gone, the Linda Vaughn celebration vehicle chosen is the Chevrolet Camaro. With Vaughn and the Hurst colors so connected to the GM performance world, picking the Camaro makes good sense – especially considering how great the 2014 Camaro looks in both coupe and convertible form once Doc Watson applied his magic touch. On the outside, the Hurst themed 2014 Chevrolet Camaro coupes and convertibles bearing the LV-1 name wear an unmistakable gold trim whether the car is painted white or black. These special edition Camaros also include a mild body kit package to give the cars a little sportier stance, unique gold trimmed wheels wrapped in high performance rubber and an interior layout with the LV-1 logo embroidered on the seat backs. There will be a total of 500 2014 Chevrolet Camaro LV-1 Editions sold with 50 white/gold convertibles, 50 black/gold convertibles, 200 white/gold coupes and 200 black/gold coupes. The first white/gold Camaro LV-1 coupe and black/gold Camaro LV-1 convertible will be auctioned off at the January Barrett Jackson Scottsdale auction and in addition to the basic rarity of these models – Doc Watson himself has autographed both vehicles to ensure their long term collectability. The proceeds from the sale of these two specially designed 2014 Chevrolet Camaros will be channeled through the automotive charity group Dreamakers to the children’s charity International Kids Alliance Network. The IKAN group uses these funds to help buy teaching tools for kids to help make learning more interesting while also helping to fight illiteracy. I'm not a big fan of the Camaro's looks, but that is actually a very pretty car. Nicely done.